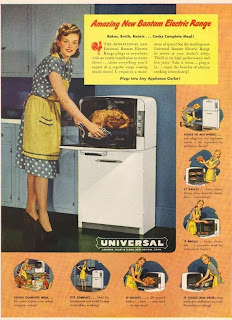 It's hard to fathom how this undersized appliance could ever produce dinner for two, let alone a holiday feast. I guess you'd have to prepare one dish at a time—and keep the wine flowing during those prolonged gaps between courses. Despite its claimed cooking proficiencies, the 1940-era Bantam didn't actually live up to the definition of 'range', as it lacked any burners. But far be it from me to nitpick the progenitor of the toaster—or maybe the Easy-Bake?—oven.